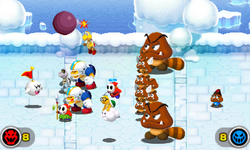 Superstar Saga + Bowser's Minions Description Starts a game of catch with the enemy captain using a Bob-omb on the verge of exploding. Pass the Bob-omb is the seventh captain command in the Minion Quest: The Search for Bowser mode of Mario & Luigi: Superstar Saga + Bowser's Minions. It costs six CP to use. When used, the captain will pass a bomb with the opposing captain. The captain in control of the player must knock the bomb back at just the right timing with each time it heads towards them. The attack ends when one of the captains fails to time their counter correctly, damaging them. This page was last edited on May 11, 2018, at 22:10.